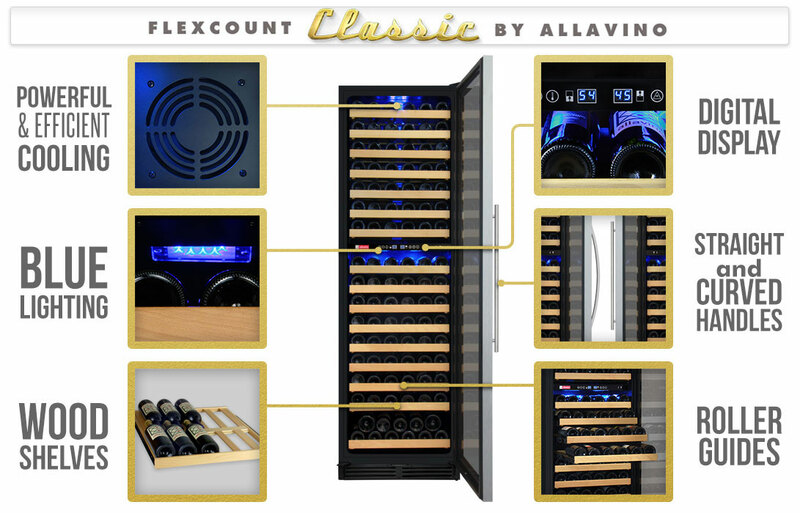 The Allavino FlexCount Classic Series YHWR172-2SWRN Dual Zone Wine Refrigerator is perfect for any wine collector that enjoys both red and white wine equally. A temperature divider in the cabinet and directional fans that channel cool air where it's needed most create two cooling environments in one wine cooler. This wine refrigerator is loaded with features like digital temperature display, push-button controls, wood wine racks on full-extension rollers, UV protected dual pane glass, cool blue display lighting and a security lock to keep your collection secure. The finished black cabinet and brushed stainless steel door frame provides a timeless look that will add a touch of class to any environment. 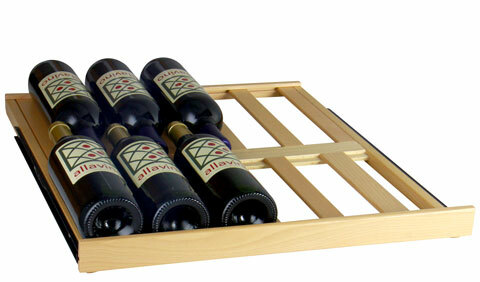 Because red and white wine age differently, it is necessary to store them at different temperatures. Internal fans direct cool air where you need it, allowing you to set the lower zone between 54-65° F for red wines and set the upper zone between 40-56° F for white wines. A state-of-the-art compressor provides powerful cooling while being efficient enough to meet the strict California Department of Energy consumption guidelines. 14 sturdy wooden shelves gently cradle your bottles and reduce harmful vibration that could upset the sediment of your wine during long term storage. Telescoping roller assemblies extend all but the bottom shelf so that you can easily view and access the rear bottles, so you don't have to remove the front bottles to determine what is behind them. Control each zone easily and intuitively with the digital temperature display and push button controls. The digital thermostat provides precise control by allowing you to adjust the temperature in one degree increments. Once the desired temperature is set, the display will show the present temperature in the cabinet, allowing you to keep track of the unit's performance. You can also control the lights, toggle between Celsius and Fahrenheit, or turn the unit off with the push of a button. The classic design elements incorporated into this stunning wine cellar will be sure to impress your friends in any environment. It's sides and top have a sleek black finish so it can be used freestanding in the dining room but it's front venting construction allow it to be built into cabinetry for a seamless look in the kitchen. Cool blue display lighting, elegant wood wine racks and a brushed stainless steel door frame complete the wine cooler's appealing look. 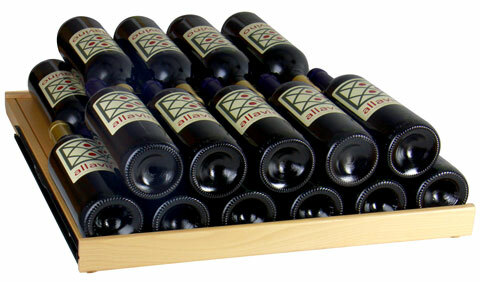 This bottle count is an estimate based on 3" diameter standard wine bottle. If you have larger bottle diameters, you may hold less bottles per rack or you can remove racks to accommodate the larger bottle sizes. Black Cabinet and Stainless Steel Framed Glass Door with hinge on right. Door is not field reversible. Minimum Ambient Temperature: The lowest temperature you want to store your wine at. The unit does not have a heater, so if the ambient temperature is lower than the set temperature, the internal temperature will match the external temperature. We realize that there is no "standard" bottle size anymore. Here is a small sample of bottle size variations and how they can affect your overall bottle capacity. Each of these bottles have varying widths and heights. Bottle A is the ideal bottle size. The bottles are just short enough that the neck of the back bottles fit between the shoulders of the front bottles without touching and the 2-15/16" diameter allows plenty of room between bottles. This allows you to fit 20 bottles on the top rack in each zone and 11 bottles on the other 12 racks with a total capacity of 172 bottles. Bottle B is taller than the average bottle at both the top and the shoulder. If only using this size bottle, the top of the rear bottles on the rack would hit the shoulder of the front bottles on the rack and push them too far to either side to have bottles all the way across the front of the rack. We were able to fit 11 bottles on the top shelf in each zone and the very bottom shelf by putting 6 bottles across in the grooves with 5 bottles stacked on top of them. On each of the remaining 11 shelves, we were able to get 8 bottles per shelf with one bottle in front and another bottle in the back, then skipping a groove before adding another bottle in the front. That would reduce the overall capacity to 121 bottles, if your entire collection were this size but you can have bottle B in the back with bottle A in the front of each rack and still achieve the maximum capacity of 174 bottles. Bottle C also works well. It is 2-3/4" wide at the base, but 3 1/4" wide at the shoulder. The grooves are spaced enough that the shoulder will touch the bottle next to it, but the height still allows you to fit the normal amount of bottles on a shelf for the full 174 bottle capacity. Bottle E is wider, with a diameter of 3-1/2". They still fit on most of the shelves without having to remove a rack, but they require that a groove be skipped between the bottles which reduced the bottles per shelf to 8 on the upper shelves and 5 on the bottom shelf. That would reduce the overall capacity to 109 bottles if your entire collection were this size. We understand that every collection is different, and we hope that providing this information will help you determine how your collection will work with this product. Great option to start a wine cellar! Comments: Had it for 6 months now with no problems. Keeps temperature well, and it is a great option for starting a wine cellar! Comments: The fridge arrived a day earlier than promised. The delivery company was great, communicating with me every step of the way. The driven called me when he was about 30 mins. out to give me a head up. He also brought the unit into the house for me. Great service. The unit was easy to set up, following the instructions were easy. We let the unit sit over night before plugging in. Not all the shelves will hold some of the bigger bottom bottles i.e. pinot noir. With that being said, they do offer enough shelves to hold those bottles. You just have to strategic on which shelves get which bottles. This unit is a beautiful piece of furniture, we have in our family room. Some of the reviews said it was extremely loud, not the case it is about as loud as a refrigerator. My only complaint with the unit is the temperatures seem to vary quite a bit fluctuating 4 or 5 degrees sometimes. I have had to raise the red temp to 60 degrees because the unit seem to be keeping them a little to cold. Other than that we are very happy with our purchase. Comments: Moved to Florida, no wine cellar, this fridge was just what was needed to preserve my more valuable wines. 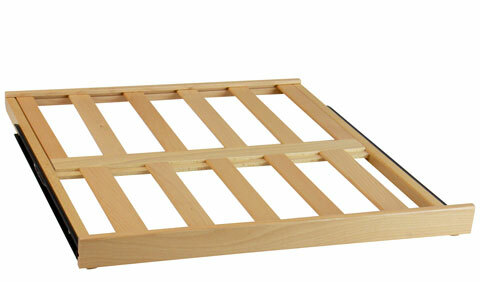 Looks good, is relatively quiet, doesn't take up much space and is easy to load and use. 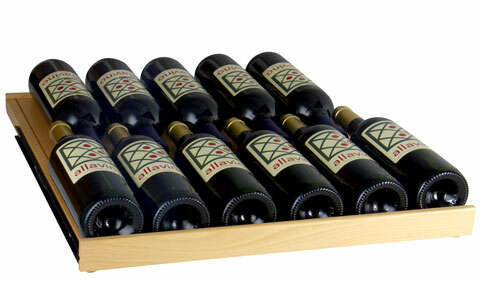 Comments: I researched many wine coolers and found that the Allavino was the best on the market. The beverage factory helped me select exactly what would work best for me. They could have up sold me but did not. The flex count 172 bottle unit was delivered right to my garage. I was very impressed with the care taken to package the unit. No dings or scratches any where. My friends helped me move it to my wine cellar. It is true you can put any size bottle in any drawer without interference. Over all I would recommend this to my best friend. Comments: We have a lot of buying to do before we completely stock this fridge. I'm keeping champagne and rose' on top at 40 degrees and it's a perfect temp. My reds are below. I love it so far! This item ships via Standard Door to Door Freight Service. Please note: Free Shipping does not include White Glove Service. If you require White Glove Delivery service where they unpack it, place it where you want it, and remove the packing materials, it will require additional charges of $300.00. Please call us at 800.710.9939 if you would like to upgrade to White Glove Service. 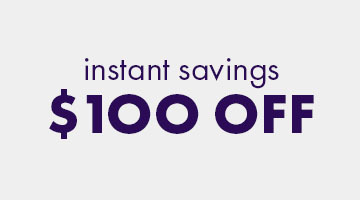 Shipping rates apply for orders shipped to the contiguous 48 US states. For orders to Alaska, Hawaii, Puerto Rico, APO/FPO addresses and international locations, please call 800.710.9939 for current rates. Sorry, we cannot ship items to a P.O. box. For one year from the date of purchase by the original owner, Allavino will, at its option, repair or replace any part of theunit, which proves to be defective in material or workmanship under normal use. During this period Allavino will provide all parts and labor necessary to correct such defects free of charge, so long as the unit has been installed and operated in accordance with the written instructions in the user manual. In cases where a product cannot be repaired, Allavino will provide you with a reasonably similar replacement product that is either new or factory refurbished. In rental or commercial use, the warranty period is 90 days. All Allavino Appliances of 3.5 cubic feet capacity or less must be brought/sent to the appliance service shop for repair. For the second through the fifth year from date of original purchase, Allavino Products will provide a replacement compressor free of charge due to a failure. You are responsible for the service labor and freight charges. In rental or commercial use, the limited compressor warranty is one year and nine months. Cost to move the appliance to the servicers' shop and back to the user's home, as may be required, are the user's responsibility. Content losses of food or other, due to spoilage. Inner door panels, door rails and/or door supports. Light bulbs and/or plastic housing. Punctured evaporator that voids the warranty on the complete sealed system. Repairs performed by unauthorized servicers. Shipping and handling costs associated with the replacement of the unit. Service calls that do not involve defects in material or workmanship such as customer education, door reversal, or proper installation. Surcharges including, but not limited to, any after hour, weekend, or holiday service calls, tolls, ferry trip charges, or mileage expense for service call to remote areas, including the State of Alaska. Service calls that are related to external problems, such as abuse, misuse, inadequate electrical power, accidents, fire, floods, or acts of God. Replacement of house fuses or resetting circuit breakers. Failure of the product if it is used for other than its intended purpose. This warranty does not apply outside the Continental USA.